Both RS and SFS have gained eminent positions in radiation oncology and have become established modalities in the treatment of cranial lesions. Most leading radiation departments offer this technique and their numbers have grown significantly in the past decade. The LINAC RS and gamma knife RS are equivalent techniques; however, technological and physical differences between these two methods have led to some confusion. Considering the RS, comparative clinical studies have documented that both therapeutic methodologies can be used with similar results. In comparison with gamma knife, the use of LINAC technology offers the possibility of dose fractionation, which has substantial clinical implications. The quality control of the complex LINAC is higher than of gamma knife and requires a specialized team of medical physicists and radiation oncologists. 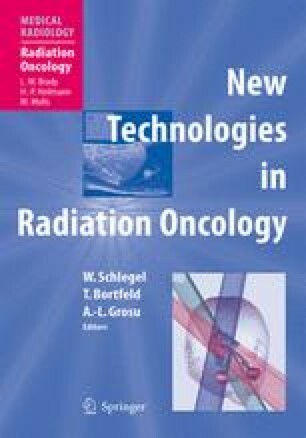 On the other hand, it is undisputed that stereotactic radiation therapy with isocentric LINAC has a high potential for further developments. Examples in this direction are the introduction of computer-guided micro-multileaf collimators which allows the delivery of a conform dose distribution with only one isocenter, using static fields or dynamic arcs and the implementation of the stereotactic intensity-modulated radiotherapy. These new technologies amplify substantially the potential of the stereotactic modality.